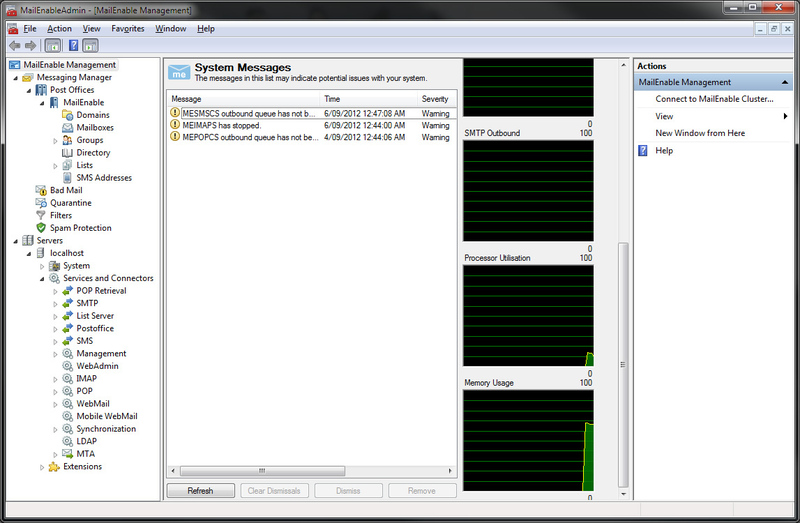 MailEnable Standard Edition provides robust SMTP, IMAP, POP3 and Webmail services for Microsoft Windows servers. Simple to install, with powerful administration software means that your mail server will be up and running quickly. This edition is free, contains no spyware or adware, for both personal and commercial usage, with no time or user restrictions. MailEnable Standard Edition provides robust, stable and fully functional POP and SMTP mail services supporting unlimited users and domains. In Version 8, Standard Edition now includes IMAP support (formerly available only in Professional, Enterprise and Premium Editions). Webmail provides the ability to manage all your contacts in your web browser, just as you would with standard email clients. Webmail also provides the ability to add pictures to contacts, pictures can be associated with entries in the global directory where users are able to update their directory image and contact details under Options in Webmail. When the mouse cursor hovers over the address field in the message header of the preview pane, an Inline Contact Card will appear, overlaying above the message header, displaying a quick snapshot of the contact details, including the contact picture. If the sender address does not exist in the Address Book, then the Inline Contact Card also provides other action buttons, such as Compose New Email or View Contact Details. 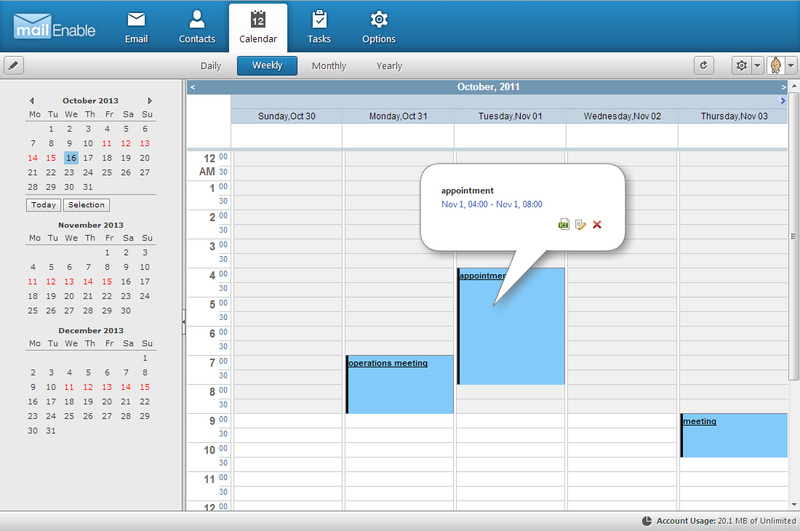 Webmail Calendar allows you to manage your appointments via drag & drop and inline editing. 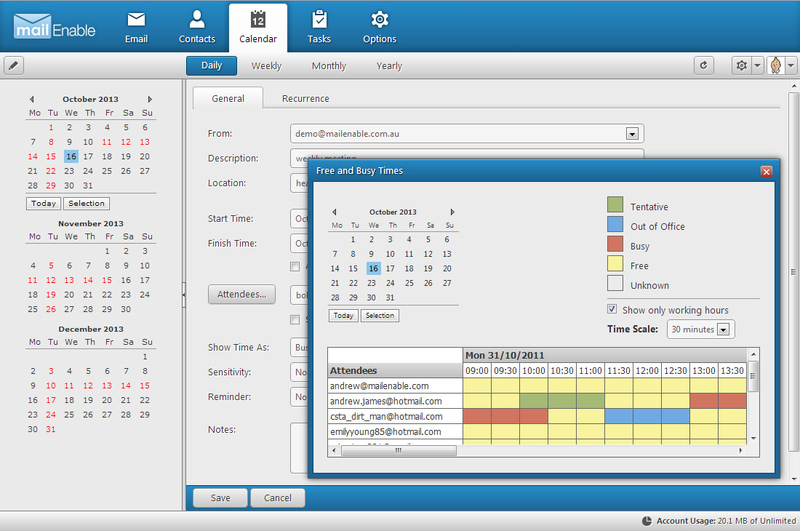 Like Outlook, MailEnable Webmail Caldendar allows users to setup & send appoinment invitations. You can schedule a meeting with others in the office, and they will receive an invitation in their inbox. They then have the option to deny your invitation, suggest another time that suits them better, or accept, in which case the appointment is immediately added in to their calendar. When you are scheduling a meeting with a group of people, it can be difficult to find a time that works for everyone. The MailEnable server can lookup and present to you a view of the free and busy status of all the attendees, so you can find a time slot where everyone is free, without having to go through the tedious, frustrating and lengthy process of sending out the invitations, waiting for the responses, suggesting alternative times, and rescheduling repeatedly. Manage your projects & daily tasks by documenting them in Webmail Tasks. 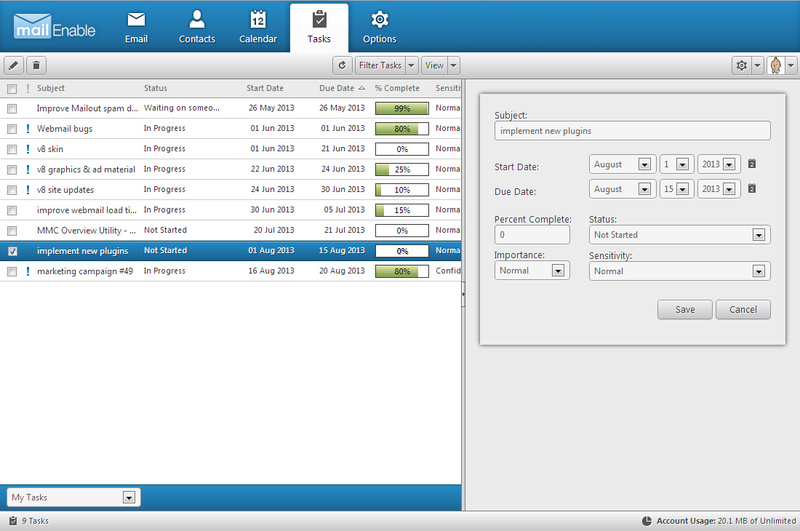 Track each task by inputting start and due dates, importance and sensitivity. You can easily update statuses and monitor percentage of completion of tasks. 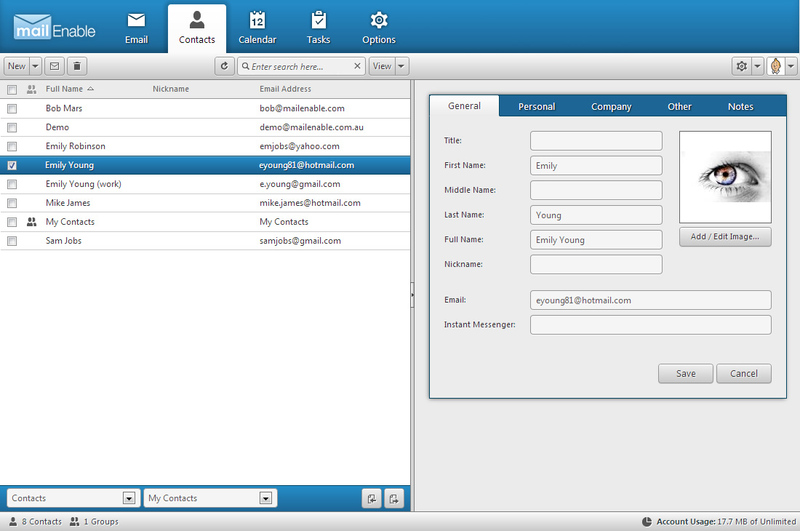 MailEnable integrates with several different third party control panel software products. Users can now set a start/end date and time for their autoresponder, to more accurately target a specific time frame where they want to activate the autoresponder. This feature is available in Webmail as well as for the Outlook/MAPI Connector. Extensive security measures and authentication methods protect your mail server from unauthorised access. Features include SMTP Authentication, Integrated Windows Authentication, Relay control. 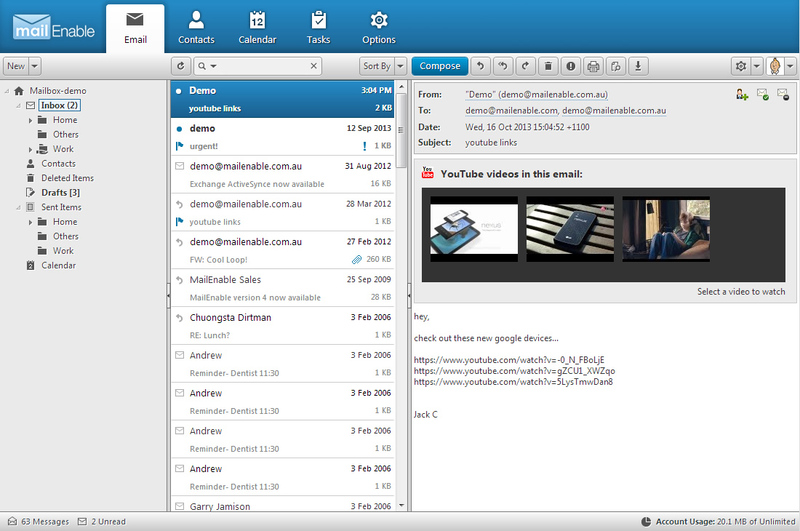 MailEnable Standard Edition has several inbuilt features to help eliminate spam. anti-spam features include PTR record checking, DNS blacklisting, auto-banning of IP addresses and much more. MailEnable is a standards-compatible mail server it can be used with a large variety of third party anti-spam software. 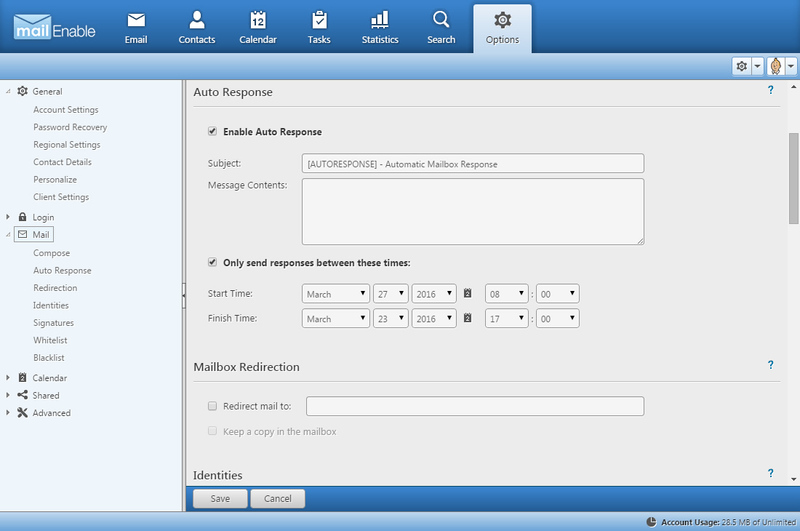 MailEnable's management console is a responsive and intuitive platform, that presents administrators with inbound and outbound connection statuses, system usage information, critical server activities and server health reports. The console equip administrators with powerful features such as the ability to monitor indexing, import domains/users, and IDN support. It also provides the ability to see the current status of the indexing service, as the number of mailboxes to index and update are shown. Administrators can jump directly to the mailbox location on disk with the addition of a "View in Explorer" menu item, and easily find lists, group and directory members with the addition of a filter. When users receive messages that contain YouTube video links, Webmail will detect these links, then automatically create selectable thumbnail previews. Users can then click on these thumbnail links, and play the video right there in the message body! Webmail's embedded YouTube Player integrates full video control, including play, pause, adjust volume, view in fullscreen buttons. Webmail has been enhanced to allow interactive inline streaming of audio files (MP3's). Messages containing MP3 file attachments can now be previewed and streamed instantaneously within the Webmail client. Users are also able to preview and stream MP3 files directly from their "My Files" storage folders. The MP3 Media Player will stay appeared on an unobtrusive position in Webmail, to allow the user to multitask and continue doing other activities in Webmail whilst listening to MP3's, such as viewing/composing messages, create appointments, contacts, and tasks. This feature requires the Adobe® Flash® Player for web browsers to be installed on the client machine. Includes a fully functional list server allowing you to subscribe or unsubscribe members and provide information mail outs or discussion groups. 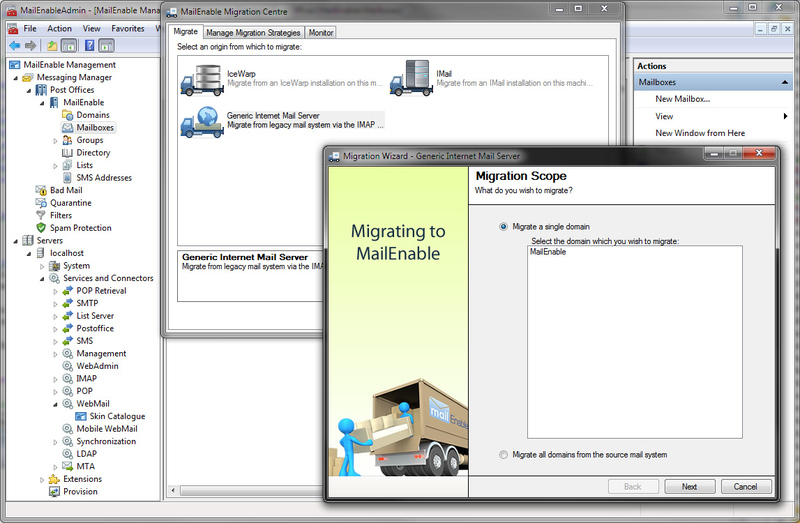 MailEnable's Migration Centre provides a simple solution for migrating from legacy email systems. MailEnable Standard Edition includes advanced diagnostics via a comprehensive Diagnostic Reporting Utility which assists in quick diagnosis of issues and speedy resolution. Features extensive logging in W3C file format to easily determine faults.